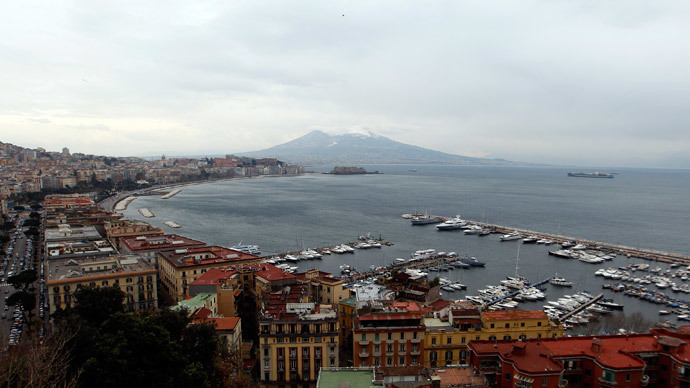 Residents of a Naples suburb had the ground cut from under their feet when they woke on Sunday morning. A giant sinkhole opened up in the middle of a street, forcing the evacuation of 380 people from four buildings on the edge of the crater. The hole, measuring 10-meters across and 20-meters deep, tore the street apart, with one Italian newspaper, Il Mattino, describing the scene as "dramatic." Authorities ordered the evacuation of 95 families. "I heard a huge thud, looked out and saw the road collapse and swallow a car," a local woman told the paper. According to the authorities, subsidence had created a small in the ground before the massive hole appeared. It is believed that a burst pipe, aggravated by heavy rain caused a further collapse, caused the ground to give way, resulting in the crater. Professor of Geology at Federico II University of Naples, Franco Ortolani, told Corriere del Mezzogiorno that the accident could have been prevented. He said the last call was five days before the disaster, on February 17. "A truck that was passing in the area had caused the collapse of the road, where a few days later the chasm originated. It is evident that it was a sign of strategic importance that had to be caught," he said. Authorities turned to hotel facilities in the area to accommodate those affected by the accident in an effort to reduce the inconvenience to local residents.